>I haven’t ridden the Winter Series at Hillingdon this year. This has given me a decent Winter break for the first time in three years, but I’ve missed the rhythm of having a weekly crit to ride. I didn’t commit this season because I thought we were moving house before Christmas. The latest guesstimate of a move date is mid-March. Next year the circuit will be too far away. I haven’t bought a road licence for this season – I may have ridden my last bunch race. Anyway, I popped down to Hillingdon last Saturday to catch up with the Series. The new clubhouse at the circuit makes it a much more civilised affair than in previous years. Unusually three race weekends have been lost to the weather this year (though they did add an extra Sunday race to replace one of these). The last races are this Saturday from 1pm – well worth a visit if you’re passing through Hayes. Former club mate Peter Dixon was riding the 3rd cat event. It was a tough, windy day. A group of three broke away and worked well together to hold off a bunch that found it difficult to maintain a consistent chase. Peter did a bucket load of work but lacked the sprint to be up there at the finish. He was 12th or 13th in the end I think. I was almost suckered into riding next Saturday. Organiser Lucy Collins had persuaded me that it would be a good idea but then I remembered that I’m riding a Prime Coaching track session at Calshot Velodrome that day. In some ways I’m pleased (I would probably have been dropped early on), but I miss the buzz of a Hillingdon race. >Apologies for the lack of recent posts. We’ve been busy with preparing for our move to the South Coast. It’s all been a bit stressful with lots of last minute dashes South to see places and deals falling through. This week, though, promises to be a bit calmer *touches wood*. Bike-wise it’s all been a bit of a disaster. One turbo session followed by a 24 hour stomach bug was last week’s work load. Nothing at all the week before. Tonight I did manage a short turbo ride after fixing a puncture – how can you pick up a thorn on a turbo? I hope to get to Hillingdon to do some open air cycling before work tomorrow. Maybe the season starts here. I won’t be able to ride the Hillingdon Winter Series this year. My fitness has disappeared completely and I need to have good form to hang on, even in a 4th category race. As for next season – who knows? It feels like it might be a later start and perhaps a lower key season – more club events and fewer opens maybe. I’ll have to see what the training grounds are like down there. The traffic seems to be as mad as London’s. One sad note (for me) – I’m leaving the Willesden CC. I’ve flogged a lot of my club kit, but there may be a few bits and pieces left if anyone is interested. >The season always seems to go up a gear in May, so I thought it would be useful to review November ’09 to the end of April ’10. November is usually a resting month – there are no races unless you ride cyclo-cross – but last year I kept the training mileage up and maintained my version of Chronic Training Load (CTL) between 110 and 120auF. Having a proper Winter bike helped, as did a few more imaginative turbo sessions and the second of my trips to Calshot velodrome. I did have problems with my weight going up, but I didn’t really care. December saw a big decrease in CTL (to the low 70s auF) as I damaged a shoulder and then caught a cold (the snow didn’t help either). I did ride the first event of the Winter Series but didn’t trouble the scorer. I was prescribed some long term meds that seemed fairly benign at the time – but more of that later. My weight went higher. The lack of auF and the surplus of Kg continues to be a theme. January saw a return to health and decent training. CTL climbed gradually back to 100auF as the month progressed. The snow meant a lot of turbo work including some hard intervals. I began to notice an inability to hit the higher heart rates, but I put this down to lack of commitment. 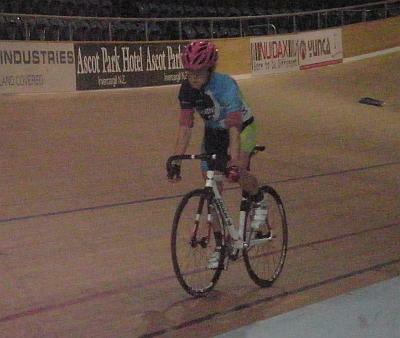 I also started attending the Willesden CC turbo sessions at Wembley which often left me knackered for days afterwards. I rode an Audax event for the first time since 1978 which, together with the ride there and back, gave me my first 100+ mile day for years and the first ever in January. At the end of the month I rode another Winter Series race and this time managed to hang on. February is the month of reliability trials and ‘traditionally’ when CTL climbs. It climbed a little more slowly than in the past – reaching 115auF by the end of the month. A couple of Winter Series events went well. My form felt good. I’d normally expect to race a lot in March, but it was difficult to find events. Those that I did ride produced disappointing performances and suggested that my lack of ability to hit zone 5 heart rates might not only be to do with lack of commitment – the meds might be implicated. I also developed a knee injury which is still giving me trouble. A trip to race in The Netherlands was good fun. My CTL did climb to a decent 120auF, but I found it difficult to maintain. At the end of the Month the doctor agreed to wean me off the meds over a fortnight. April has been a better month. We’ve had great weather and the reduction and then abandonment of the meds seemed to have given me back some top end performance. However, CTL has dropped away slightly (to around 115auF). My weight has also started to increase again (damnit!). My 1:02:04 for a ’25’ on the 18th was real breakthrough performance and I need to build on that. Unfortunately the weather forecast for the weekend looks poor at the moment! My determination to race less looks a little weak: I have four events in four days coming up over the Bank Holiday weekend. I have done 10 events less than this time last year though (15 as compared to 25). None of my season’s targets have been threatened yet and the slow start to the year might mean that they’re safe. I haven’t quite given up yet though. Plus points: I’m pleased that I kept training through the Winter and didn’t let illness in December get to me. I’ve dealt with the meds situation and that is now, I hope, behind me. I’ve made cycling more interesting by managing my turbo sessions better, incorporating track work into my schedule and riding a race in The Netherlands. Less plus-ful points: After the madness of this weekend’s schedule, I need to schedule my race efforts more carefully. I’m concerned that the longer distance events needed for a BBAR effort may be beyond me (the dates don’t fall kindly either). I have failed to adhere to a structured training plan again – I am a pretty useless self-manager (not just in cycling). Here’s to May and June – the season of PBs in the last couple of years. And here’s to July, August and September – let’s try and sustain the season this year. >I did not get into the first half of the field in the last Winter Series event – 26th out of 39 finishers. Work to do on the sprint. Alex Murray’s write up is here and Martin Porter makes a great case for riding the series here. My sister Marie (left) has added a Southland region Bronze Medal in the Women Masters Individual Pursuit to her NZ Masters Games medals. She has now been selected for the Southland team for the National Championships on March 3rd. Good luck, Masha. I’ve had a pretty duff week for motivation. I didn’t touch the bike on the best day (Wednesday). Though I’ve had downs this Winter this is the first time I’ve had problems with training. Hopefully this weekend’s Calshot session and the Willesden CC reliability on Sunday will re-engage me. >Another (my third) Winter Series done. Race #12 was fairly uneventful. The bunch moved quickly to start with, had a forced deceleration for a few laps when the 3rd cats caught us, and then finished at some speed. At five laps to go I should have started to move up (Alex Murray even offered to guide me through the bunch). I demurred – too scared to go early. It’s a pity because I’d recovered from a mid-race gasping episode. As it was, I started to go forward with two laps to go and (I hope) finished in the first half of the field (*edit* actually 26/39). I even rode the finish straight out of the saddle (as if in a slow-motion sprint). Thanks to Lucy, Richard, Doug and the rest of the Collins clan and their friends who organise and run these events that keep us going through the winter. Thanks also to all the (overworked) first aiders, commissaires, judges, photo finish pixies, photographers, supporters and riders who contribute to the series. The end of series prize giving saw awards (including trophies, champagne and flowers) being handed out for the tightly fought series titles. There were also Lucky Racers prizes drawn out of a hat. >Imperial Winter Series, race 11. I enjoyed today’s race. Conditions were cool with a headwind blowing down the finish straight. This week I managed to start in the top ten and stay there for several laps – it makes the pace more even if you can do this. Mid-race I had a few minutes of fighting to close the gaps, but I don’t think I was near to being dropped. Later on I recovered and finished strongly (by my standards). There were plenty of breaks so the pace was consistently high as they were chased down. After a fairly incident free race, the last couple of circuits got twitchy with people shouting at each other things like: “hold your line”, “watch where you’re going” and “lend us a fiver till Tuesday”. When this starts to happen you get a feeling something is going to go awry. At the side of the track some of my team mates had turned up and told me to move up in the last few laps. Ever obedient, I did manage to gain places (though I got stuck mid-field). This effort might have saved my bacon – there was a crash on the last corner. For once I was ahead of it and ‘sprinted’, probably for 25th place or so. ** Update ** I was actually 16th – woo hoo! I suppose I’m another week fitter, hence the better ride. I also shaved my beard off which saves weight and reduces aerodynamic drag. The race was won by Matt Sheppard of Worcester St Johns CC in his first race. I was pleased as the St Johns is one of my old clubs. It was good to have a brief chat with cyclist/blogger/lawyer Martin Porter on the wind down lap. He was much more active in the race than I was though he got caught behind the melee. Next week, perhaps. Next week is the last event of the Winter Series and possibly my best chance of a win… they’re having a raffle. >Imperial Winter Series, race 10. >Don’t go looking for my reports on races 2 to 9 – this is the first one I’ve ridden since the opener in December. A cold, a holiday and then low fitness led to an involuntary Winter break. I didn’t want to race today, but since when has that been a decent excuse? 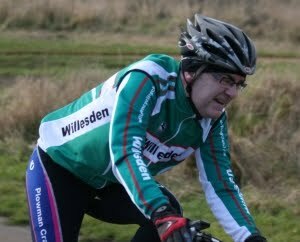 I headed to Hillingdon expecting to be shelled out on lap 1 or 2. But I managed to hang on. Well, I hung on until getting caught behind the crash and taking to the grass with just over a lap to go. It’s nice to be back on a race bike and riding in a fast moving group, especially after taking so many kickings in training in the last few weeks. The pace was brisk, but fairly even. I sat mid-bunch and coped with most of the accelerations – saving a few desperate efforts around the top of the course. Breaks went fairly regularly but the bunch kept tracking them down. I missed the finish, but I guess it was a bunch gallop. The standard of riding was pretty good – only a few drifters and switchers. The trouble often happens late when tiredness impairs judgment and ambition outstrips common sense (“I can win from the middle of the bunch“). It was goo to be back on board and to ride a decent race. It was also a chance to catch up with fellow blogger Alex Murray and to see blogger Martin Porter recover from a puncture and finish well. For the second week in a row I arrived home with a front wheel puncture. More expense, but at least it didn’t affect either event. >The last time I rode the bike out of doors was in the Winter Series circuit race on 5th December. Since then I’ve had a mild cold, time away for Christmas in the Yorkshire snow and several days of looking at rain. I have ridden on the turbo trainer a few times – I even took it on holiday (what was I thinking) – but the efforts are compromised by an unusually high heart rate at the moment. I had hoped to keep my fitness level at over 100 AUOF* during the Winter, but the virtual lay off has seen it reduce to nearer 60 AUOF. There’s going to be a lot of work to do during January to get fit again. I don’t think I’ll be fit enough to ride any more of the Winter Series, so my next targets will be the Chiltern Classic reliability trials and perhaps some local Audax events. I am, at the moment, enjoying the last bit of my traditional Winter cold. It’s been a mild affair but goodness it’s dragged on. I’ve managed two zone 2 turbo sessions in the past ten days. It feels like all of the good work of keeping the miles going through November has been lost. I’ve been generally out of sorts recently. The doctor sent me for blood tests and they’ve all come back clear (apart from the old cholesterol). I guess that this means it’s all in the mind. I had hoped to race the Winter Series #3 tomorrow, but today’s turbo effort suggest that this would not be wise. Plus it’s icy and snowy at the moment. Good luck to any riders who do ride. Family commitments will eat into training and racing time over Christmas. I hope to be back on the bike and racing by the New Year. >Imperial Winter Series, race 1. It’s only been a few weeks since the last race of last season, but I felt very rusty preparing for today’s race. Training seems to be draining me even though the miles are down and the big efforts are off the schedule. I suspect the cold weather is hitting everyone hard. At least I get to ride a proper racing bike – it feels like a magic carpet after a few weeks on the ‘mudguard machine’. It was good to meet up with friendly rivals again (including blogger Alex Murray). I see that Martin Porter, another 4th cat blogger, was in the field as well. The race started off at an easy-ish pace – which was good as it seems to take me longer and longer to get my bloody foot clipped in. It was a big bunch and space was tight. There was an early crash in which Willesden CC team-mate Tom was brought down. I hope he’s okay and recovers quickly. There were plenty of WCC spectators – I was asked at one point if I had my own fan club. The race was running on the circuit at the same time as the 3rd category event. As their large field caught our large field it split, which led to an extended overtaking manoeuvre (over a lap). The increase in pace and elongation of the field (each race is supposed to keep to its side of the track) led to gaps opening and… several riders, including me, were shelled out of the back. We, as the slower race, are supposed to neutralise the action as they pass, but the temptation to steal a sneaky march on other riders is too much for some. Perhaps, if I was at the business end of the field, I’d have been tempted too. I rode a few laps solo and then dropped out to savour the sprint action. Unfortunately the 4th cat’s final acceleration pushed them into the back of the 3rd cat race on the last lap leading to a confusing finale. It’s very difficult to manage two large races of fairly similar ability on such a small circuit. Race stats: Race distance: 14.29 miles, time: 36:30 (23.5mph average speed). DNF. Top speed: 31.0mph. Fastest mile: 2:19 (25.9mph – mile 11), slowest mile: 2:55 (20.6mph – mile 14). Average HR: 154bpm, maximum HR: 168bpm. Winner: ? Heart rate is a bit down – I had an ‘almost a cold’ earlier in the week and this might be the cause. Pat now has a full blown cold, so we’ll see if I can catch it and get out of next week’s race.